Here is a photo of last night’s concert in MUSA, the Museum of the University of St Andrews. Historic Scotland have confirmed the dates of the cathedral concerts in St Andrews this summer: 5 June, 3 July, 7 Aug and 4 September. Full details are on my Cathedral page. The most exciting new programme for 2012 will be July’s event. I will be telling the story of the wedding of Princess Margaret of Scotland to the King of Norway in 1281, and the subsequent events which led to the Wars of Independence in the 1290s. 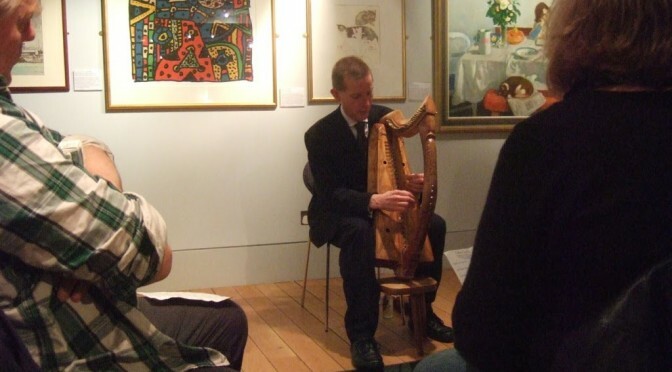 There are a number of Fife connections with these events, including the Dunfermline and Burntisland setting of the traditional ballad which I learned from a recording of the traveller Duncan Williamson, who eventually settled in Ladybank. There is also the famous cliff fall of King Alexander III at Kinghorn which led to the succession crisis. 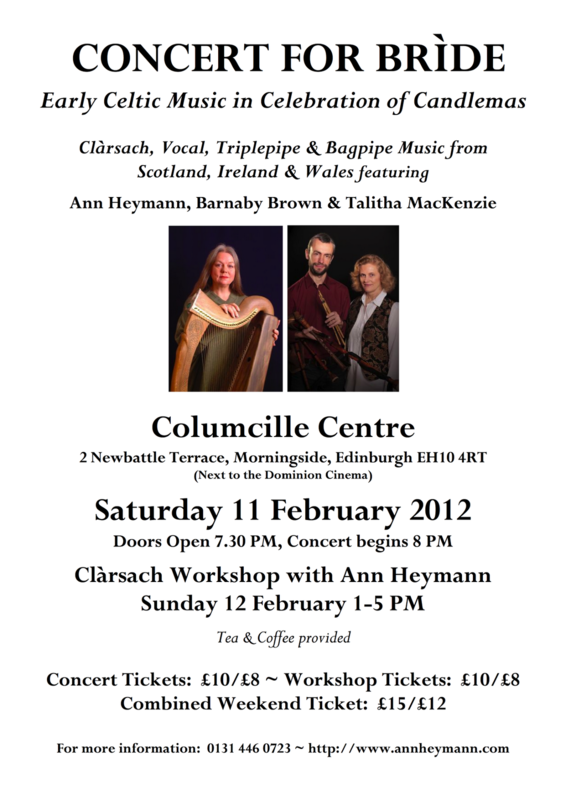 This past weekend I was in Edinburgh for Ann Heymann’s concert and workshop. 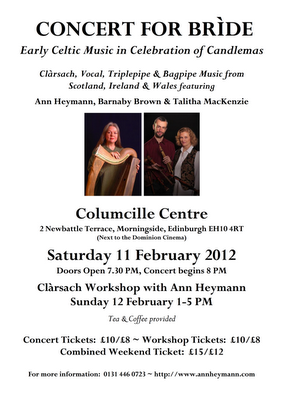 On Saturday night, the concert was presented by Ann Heymann playing a beautiful painted and gilded medieval clarsach, Barnaby Brown playing replica 18th century highland bagpipes and also early medieval triplepipes and singing, and Talitha Mackenzie singing. 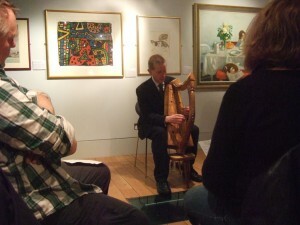 The programme was a very well balanced selection of old Scottish and Irish music. At first there was some Latin ecclesiastical music, for the theme of St Bridget, but most of the programme was the old Gaelic traditions, with songs and instrumental ceol mor. The music was presented by different combinations of performers, some solo, and some in pairs, and the occasional trio – I like this approach as to my mind this ancient Gaelic repertory works best as an unaccompanied solo art and too much collaboration can dull the edges of the music. 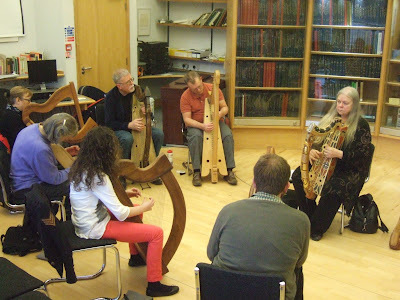 The collaborative performances were well chosen – Ann accompanied Talitha for Deirdre’s Lament most beautifully, and all three played and sang Uamh a Oir (the Cave of Gold) very effectively. 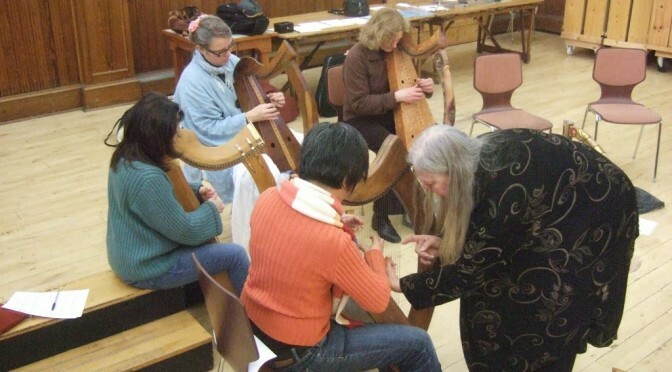 Sunday afternoon’s workshop was led by Ann Heymann, and there was a respectable turnout of historical clarsach players there including a strong contingent of my own Edinburgh students. Ann worked through a very interesting series of technique discussions which I think were of interest and use to all attendees, both long-time expert players and complete newcomers. There was also some very nice banter between Ann and Alison Kinnaird, with them both reminiscing about their earliest meetings and work together. At both the concert and the workshop, half-time refreshments were provided by tea expert Rebecca Mackay who provided a selection of fine single estate Ceylon teas and some amazing homemade honey cake. On Wednesday, I hosted Ann Heymann’s visit to the Wighton Centre in Dundee. 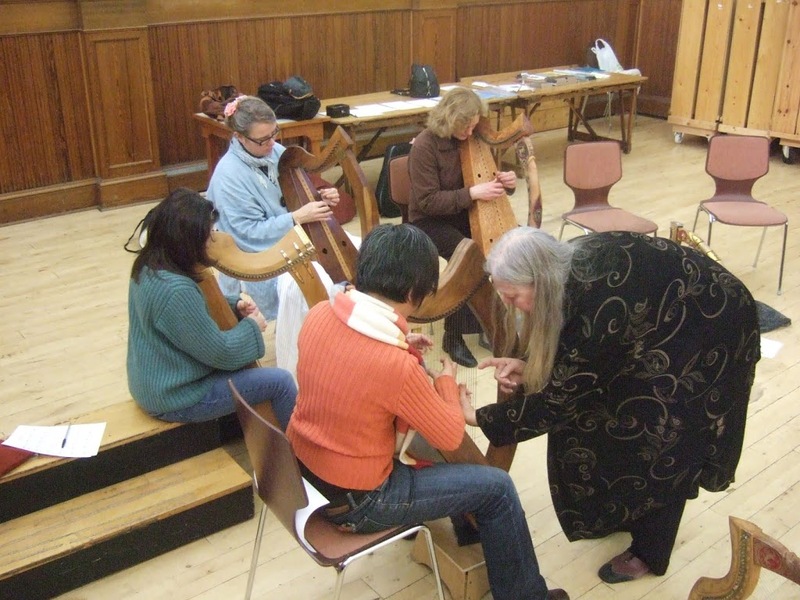 As well as performing a concert, she gave a workshop and I was pleased to see a good turnout from my weekly Saturday harp class regulars.